KUCHI JEWELRY LLP products are designed, crafted and manufactured in-house, lavishly finished by hand with artisanal dedication. We believes in using age old craftsmanship techniques combined with new age manufacturing improvements, to create a fresh look. The fineness of our craftsmanship and the legacy of ornament design is beautifully displayed in each piece making them the most cherished expression. Our collection is varied and each design is created to suite all styles and tastes. Our designs stand out to be unique, and one of a kind. Each and every product is set to make you feel special. 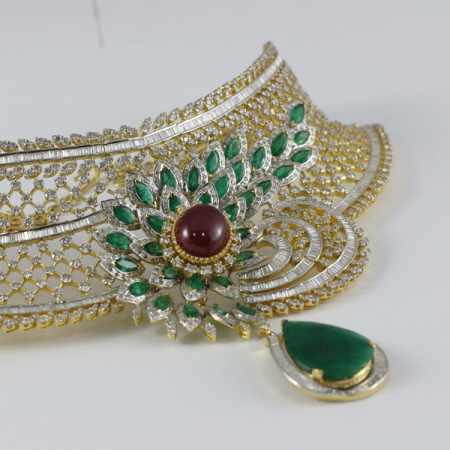 We have provided our elite clientele with exquisite jewels that blend elements of classic elegance and contemporary taste. A harmony of boundless imagination, technical brilliance and meticulous detailing; our magnificent masterpieces are symbols of prestige and indulgence. We have always cherished the importance of the heritage, style & innovation. Our designs have stayed true to India’s ancient heritage. But that doesn’t mean we focus on the past. Our eyes are clearly on the future. We use a state of the art manufacturing unit that brings cutting edge innovation to jewellery making, putting the art and purity of the jewel above all else. The fineness and style of the ornaments reflects the standards of the brand's expertise. The brands impeccable quality has allowed the business to grow at pat with international standards of designing & manufacturing & stringent quality control measures. We constantly strive for excellence in providing affordable & luxurious designs to the global market.